Document Security - Security Pros, Inc. According to a variety of studies, businesses lose between $2 billion and $4 billion a year to their competitors. The losses are the result of a competitor’s learning the business secrets of others, many times through underhanded means. 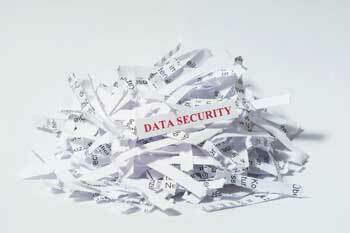 Lock-up and secure sensitive information and control access to these locked files. Safeguard your computer network via firewalls and a password-protected system, which is changed frequently. Backup business information and store at a remote server or have a copy of this in a secured second location. Purchase and use portable shredders, distributed near trash receptacles throughout the office, for your discarded sensitive documents and watch closely what winds up in your trash and recycling bins. If you have a large amount of documents to be discarded, consider a commercial shredding company.